Karunakara Guru was born in 1927 as Karunakaran in a place called Chandiroor in the present-day Alleppey district of central Kerala. After enlightenment, he talked about a global Cultural and Spiritual Renaissance in the society. He exhorted his disciples to achieve this change to ensure a harmony in material progress in their lives. Through his teachings, Karunakara Guru laid stress on the spiritual aspect of the soul that bears the karmic impurities and cleanses the mind of all the bad effects associated with them. He further added that the removal of impurities related to the personal actions would help people to sanitize their minds. These findings have huge relevance to the society when people are dividing it based on caste and religious lines to stay in power. This is the reason why he is regarded as the social reformer in modern Kerala. The ashramam was set up with the clear vision of providing a revitalized life for people. The founder Guru exhorted his followers to lead a meaningful life by incorporating the cultural, spiritual and economical dimensions in their lives. Essentially, the founder sage had a secular view about the society where people from various faiths co-exist happily. Apart from the main ashramam in Thiruvanathapuram, it has its branches in other locations as well. The other branches of ashramam are located at places such as Idukki, Chandiroor, Kottayam, Ernakulam, Palghat, Kannur, Sultan Battery, Kozhikode, New Delhi, Bangalore, etc. People visiting the ashramam premises can spend more than 2 hours looking at various attractions and take part in various activities there. The inmates of ashramam leave no stone unturned to make you understand the teachings of the Guru whether you like it or not??! Nearly a decade after the death of the founder Guru Karunakara, his followers had decided to raise a Parnasala in this name to tell the world about his teachings and their relevance to the present society. As a result, a beautiful structure has come in the Thiruvanathapuram branch of ashramam in Pothencode. They have chosen to christen it as Parnasala. The structure is built in the form of a blooming lotus. The construction is made of white Makrana marble. It was dedicated to the nation by then honourable President of India Pratibha Devi Patel on August 13, 2010. Later, it was opened to the general public to offer prayers and worship on September 12, 2010. Due to its uniqueness in design and appealing beauty, the Parnasala has become a landmark of Thiruvanthapuram city. Ever since the beautiful structure was thrown open for public, it has been attracting a lot of tourists. The visitors are expected to observe silence when they are in Parnasala so that prayers of other people are not disturbed. People visiting the ashramam premises would be taken through a guided tour. The disciples of Karunakara Guru volunteer themselves to do the job of a guide. They would take you to all relevant buildings within the campus and explain to you the meaning of whatever that has been found there. The visitors can also take part in other kinds of activities undertaken in the ashramam. They can take decision on these activities without any compulsion. The disciples just suggest what the visitors could do to help the charitable purpose. Here, we are listing some of the activities undertaken by the ashramam authorities to help the poor. Please go through the list to understand where you can contribute to sustain these noble activities. Annadanam: Ashramam was set up by the Karunakara Guru with intention of feeding the poor. Hence, the ashramam gives free food to the needy at its centres across the country. Anybody can take part in this service. People desirous of giving some money for this charity purpose can do so and get a receipt from the ashramam authorities. Athurasevanam: The ashramam inmates provide the supporting services for the welfare of needy and ailing people. For this purpose, the authorities have a created a string of Ayurveda research centres, hospitals and clinics throughout the country. The common man can avail these facilities without paying a penny from his pocket. If at all chargeable, it would be nominal. Athmabodhanam: Karunakara Guru believed in athmabodhanam or spiritual awakening. He advocated that there are two levels of spiritual awakening. They are rational and transcendental types. The former focuses on the eradication of ignorance, whereas the latter looks for ways to acquire the knowledge of reality. Economic Development: The guru believed in providing required skills to help people from vulnerable sections of the society to stand on their feet. He believed that the economic improvement of people can really happen only when they become employable. With this end in mind, ashramam offers training to women and other downtrodden people on various industrial skills. It also offers support to people who wanted to start cottage industries. Santhigiri Ashramam was established by a social reformer and saint by the name Karunakara Guru. He believed in revitalizing the lives of people by helping them incorporate spiritual, cultural, societal and economic elements in their mind. In keeping with these vision statements, the ashramam authorities provide free food, training, counselling and treatment to all the sections of the society. People who want to set up cottage industry will get technical and financial assistance from the ashramam as well. These activities are undertaken with the clear vision that the economic development can happen only when healthy people become industrially employable. 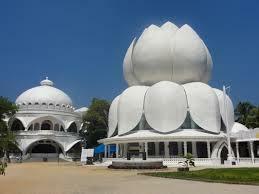 Due to the presence of blooming lotus-based parnasala made of white marble, the ashramam has become a focal point of tourism in Thiruvananthapuram. This building offers an opportunity for people to prey and worship god without any disturbance. Visitors will be taken for a guided tour by the inmates of ashramam, giving full information on Guru's teachings. Sometimes these teachings may make you sleep in between. Anyhow, the visit to the ashramam premises enlightens the tourists on their spiritual side and brings solace in their minds.